You are here: Home / Parents / What are you thankful for? Thankful Tree craft perfect for Thanksgiving! Fall is in full swing. It’s time to dust off that holiday craft box tucked away in your closet and make some beautiful memories. Our team recently discovered the awesomeness of Mod Podge. If you are not familiar with Mod Podge, it’s a decoupage medium — an all-in-one glue, sealer, and finish that works on paper, fabric, and wood. It also gives the finished product a beautiful glossy look. Thanksgiving is a time to “count your blessings”. In the spirit of the season, we invite you to make a family “Thankful Tree.” This simple kid-friendly activity is a fun alternative to family game night or an indoor weekend with the kiddos. Painting the canvas. You and your child can paint a sunset or just one solid color. Let their imagination run wild. Once painted set aside to dry. If you have toddlers at home this is a great way for them to contribute. Let them mix paint colors and cover the canvas with their unique touch. Cut the tree trunk out of construction paper. Draw or sketch it first if you like, or cut free hand. Be Thankful. On each leaf write something your family is thankful for. Decide what to write together, or take turns allowing each person to contribute personal thoughts. Time to assemble the trunk, Leaves, Kite (optional) onto the Canvas. We added a kite that says “I am thankful for…” Consider adding a cutout such as a kite, pumpkin, or other fall-themed objects to title the artwork along with the names and ages of the artists. Place the trunk, kite, and leaves on the canvas where you want them. Cover in mod podge. Using an old brush or a brush you don’t mind getting glue on paint the bottom of the trunk, kite (optional), and leaves. And press down on the cut-outs. Seal your masterpiece with Mod Podge! Yes, Mod Podge can be used as both a glue and a protectant. Wait about 45 minutes for the mod podge to dry. How does this work? 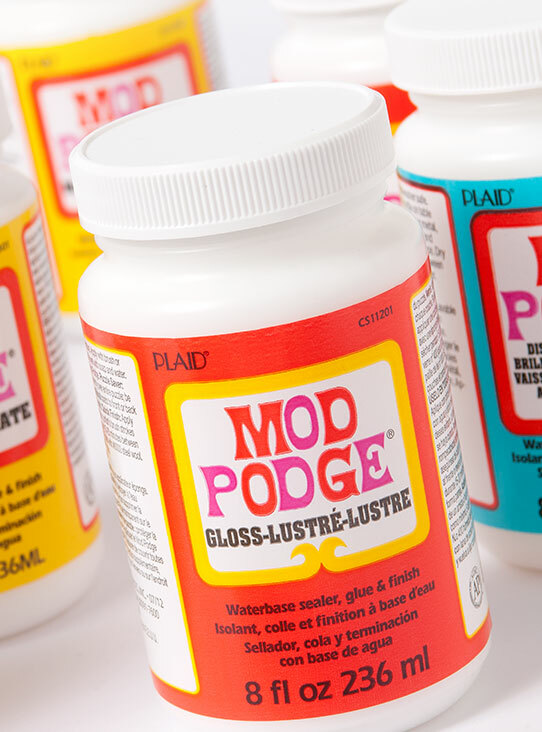 Mod Podge is mostly water and polyvinyl acetate, a common ingredient in most white glues. The original formula was released almost 40 years ago. The polyvinyl acetate is what makes the glue water resistant and give it that glossy finish. When you apply mod podge onto a surface it comes out white like regular glue. When the water evaporates from the emulsion. This is why if you accidentally get mod podge on your kitchen table or carpet like we did there’s no need to panic. Just try to catch it early and clean it up while it is wet or to use dish soap (an oil) to help separate the water molecules. Step back and admire your beautiful work. Add it to the mantle, or other special place in your home. Mod Podge creates masterpieces that last a lifetime. Happy Crafting! !